My last year has been full of change. It seems like a tremendous amount of change, and without embracing that change, I’m pretty certain that rather than the exceptional amount of growth that I’ve had in the past year, I would be in tears at the moment. But instead, I am celebrating the excitement that life holds for my family and me. A dear friend and spiritual teacher once told me that shamanically we are asked to find the lesson in each challenge, as well as to express and feel gratitude for what that event, person, experience has taught us. Change is inevitable and the faster we can find and appreciate our lesson, the smoother the transition and the sooner we can open up to all of the beauty that is there for us in that change. This past April, my family lost everything in a 7.8 magnitude earthquake. It was hard to mourn the physical possessions when we saw our entire town destroyed, with many loosing so much more than possessions. The loss of life and of an entire community was so much worse than loosing my beloved surfboard, special treasures, my home and all that went with it. Though we did mourn our loss of community and all that was our reality up until that point, coming back to my yoga, to breath, to self-care, to balance and to gratitude, has enabled me to be open to the beauty of the next chapter in my life. Little did I know when all of the devastation of this was happening that it would actually be opening me up to something even better, and from change to change, now my family is blessed to be headed to the Caribbean to live and work for the next few years. It means the end of being the leader of a beautiful yoga community here in Delaware, but the beginning of an exciting adventure. 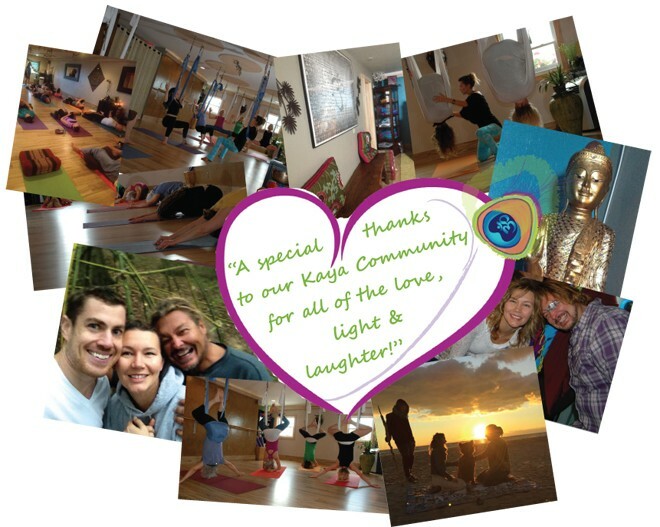 With gratitude, I thank all who have supported and grown Kaya Wellness & Yoga. What a beautiful community has gathered here for fun, laughter, enlightenment, healing, and connection to self. We are so pleased to announce that Dimitra Yoga will be continuing the yoga and wellness community at our Rehoboth location. Our Kaya family of healers will be continuing in this space, including Bob and Heather returning to offer services seasonally. And for more information on Heather & Bob’s next great adventure, contact them at kayawellnesscenter@gmail.com. For more information on the grand opening of Dimitra Yoga in downtown Rehoboth Beach, call (302) 645-9100 or visit dimitrayoga.com. ← Previous Story Is Willpower All In Your Mind? Next Story → Five Quotes From Joseph Pilates That Will Powerfully Influence Your Life!